With more than 35 multi-million dollar verdicts and settlements, totaling over $200 million dollars, Rick Jurewicz handles Galfand Berger's catastrophic product liability, construction accident and automobile cases. As a Pennsylvania Super Lawyer every year since 2004, Rick is recognized by his adversaries and opponents as an extremely skilled trial attorney who tenaciously represents his clients’ rights. Rick has been selected to the Pennsylvania Super Lawyers Top 100 lawyer’s list, an honor limited to only 100 out of Pennsylvania’s nearly 34,000 lawyers! 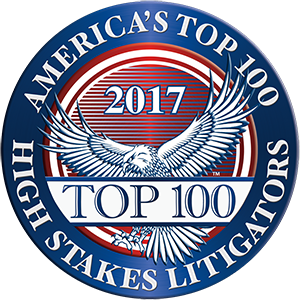 It is no surprise that Rick was also selected to the category of top 100 Philadelphia attorneys. Rick has been responsible for achieving most of the largest recoveries and verdicts in Galfand Berger’s history. Such notable results include a confidential $36 million dollar settlement for three workers in a furnace explosion, $12 and $8 million dollar settlements for two paraplegic construction workers, a $10 million dollar recovery for a worker crushed by a crane, a six-million dollar recovery for an ATV accident that left a child blind and two $5 million dollar recoveries for steelworkers, one of whom was crushed to death and the other who suffered a moderate brain injury while operating a wire drawing machine. Rick is a Senior Partner having worked his entire professional career with Galfand Berger since joining the firm’s litigation department in 1984. Following law school, he clerked one year for the Honorable James T. McDermott of the Pennsylvania Supreme Court. Rick then came to Galfand Berger to begin a career as a trial attorney in the firm’s litigation department. Rick is Board Certified in Civil Trial Law and Advocacy by the National Board of Trial Advocacy. He is also one of 100 Pennsylvania attorneys inducted into the Outstanding Lawyers of America. For several years now, Rick has been included in The National Trial Lawyers Top 100 Trial Lawyers of Pennsylvania. Rick is also listed in Best Lawyers in America, an honor given to only 55,000 of the nearly 1.3 million lawyers in the United States. He is a Lifetime Charter Member in the Best Attorneys of America. Since 2015, Rick has also been selected in the National Association of Distinguished Counsel and has received a “Lead Counsel” rating. Rick has received an “AV” rating by Martindale-Hubbell, which is the highest rating an attorney can receive. Rick is a fellow member of the American Academy of Trial Counsel, whose membership is comprised of less than 1% of all attorneys in the United States. He has been admitted to practice before the Third Circuit United States Court of Appeals, United States District Court for the Eastern, Middle and Western Districts of Pennsylvania, the Superior Court of Pennsylvania, and the Supreme Court of Pennsylvania. He has served as an Arbitrator for both the Philadelphia Court of Common Pleas and Eastern District of Pennsylvania. Rick is a member of the Pennsylvania Bar Association, Philadelphia Bar Association, Pennsylvania Association for Justice (PaAJ), and the Jagiellonian Law Society. Additionally, Rick is listed in the Martindale-Hubbell Bar Register of Preeminent Lawyers for Product Liability. Rick has had numerous published opinions on cases he has handled. He is the author of several articles on product liability, product safety and construction litigation and has lectured on such topics as products liability, construction litigation and hand injury cases. He is a member of the Million Dollar Advocates Forum having obtained numerous million dollar verdicts and settlements for his clients. Rick is co-founder and was past President of Kids’ Chance of Pennsylvania, Inc., a non-profit organization that provides scholarships to children. When not practicing law, Rick has a passion for scuba diving. Rick has had numerous published opinions on cases he has handled. He is the author of several articles on product liability, product safety and construction litigation and has lectured on such topics as products liability, construction litigation and hand injury cases . He is a member of the Million Dollar Advocates Forum having obtained numerous million dollar verdicts and settlements for his clients. Rick also wrote a chapter for The ABA Medical-Legal Guides: Head Trauma and Brain Injury for Lawyers. This legal treatise details the law surrounding traumatic brain injuries. Read Richard M. Jurewicz's blogs and firm news.